It´s not quite gone, but the just released NGDP growth data clearly indicates that monetary policy has, if anything, been tightening. The chart shows that NGDP growth at annual rates has been trending down for a year, and this does not consider that the level of nominal spending is way below any reasonable trend level. Will this fact put some pressure for action during the upcoming FOMC meeting? Will the inflation hawks come to their senses and finally see that instead of going up inflation is coming down? Will the “fence sitters” conclude that the data is already very bad and that there´s no sense in “waiting for additional data”? I have no idea, but given the history of the last three years, I´m not optimistic. The drought in parts of the U.S. farm region has caused prices for commodities including corn, wheat and soybeans to jump this summer. But the rise in farm prices won’t have anywhere near the negative impact on consumer inflation that would come from a similar gain in oil. If no other price pressures build, future inflation would remain close to the Federal Reserve‘s 2% target rate. Perhaps the bigger worry in the food price outlook is the possible impact on foreign wages. Food makes up a much larger share of total inflation in emerging economies. If businesses in emerging markets have to make higher cost-of-living pay increases to their workers, higher labor costs might lift prices of imports coming to the U.S.
That hasn’t shown up in the import price data yet, but a persistent uptrend in global food prices could change the dynamic. Seriously, I think she put on her namesake comedian hat before writing the piece! Federal Reserve officials, impatient with the economy’s sluggish growth and high unemployment, are moving closer to taking new steps to spur activity and hiring. Determined to keep trying to get the economy going without causing inflation, the Fed is exploring other novel measures. One idea mentioned by Mr. Bernanke in his testimony would be to use a facility the Fed calls its discount window to provide cheap credit directly to banks that make new business or consumer loans. But it isn’t clear such a program would do much good when banks already have ample access to cheap credit and this kind of program doesn’t appear to be winning favor at the moment. Mr. Bernanke told Congress he wants to see more progress in reducing unemployment and he expressed frustration the economy appears to be “stuck in the mud.” The Fed chairman has spoken in the past about the importance of the economy achieving what he calls “escape velocity”—growth that is fast enough to give the economy forward, self-reinforcing momentum. Ultimately, I think the Federal Reserve made a huge policy error in committing to an explicit 2% inflation target. I think policymakers were under the impression that such a commitment would give them more flexibility by removing concerns that QE would be inflationary. In reality, I think it had the opposite effect – it eliminated a policy tool, thereby reducing their flexibility. And that commitment stands as a barrier to Evans’ suggested policy path. I think the rest of the Fed would loathe accepting inflation as high as 3% given they just committed to 2% at the beginning of this year. In doubt, they would view such backtracking as a threat to their much-cherished credibility. Interestingly, they don’t see Treasury rates below 1.4% as a threat to their credibility. They really should. I thought so the moment the target was made official (here). The fact is that Bernanke has made one bad move after another, but keeps saying “there´s a lot more the Fed can do” (if only things get worse)! Thirty years ago the Volcker´s Fed took drastic action to bring inflation down. At the time the real economy suffered – RGDP fell and unemployment soared – because inflation expectations were entrenched, i.e. the Fed had little credibility. But note from the chart that once Volcker showed he meant “business” inflation expectations rolled down even while nominal spending was rising fast to get the economy on track. And soon the economy was back to “potential”. Nothing of the sort, aside from falling inflation expectations, is happening now. The 2% target is really a formidable barrier! Once, very wrong; second time, got it right; but “screwed-up” on the third. 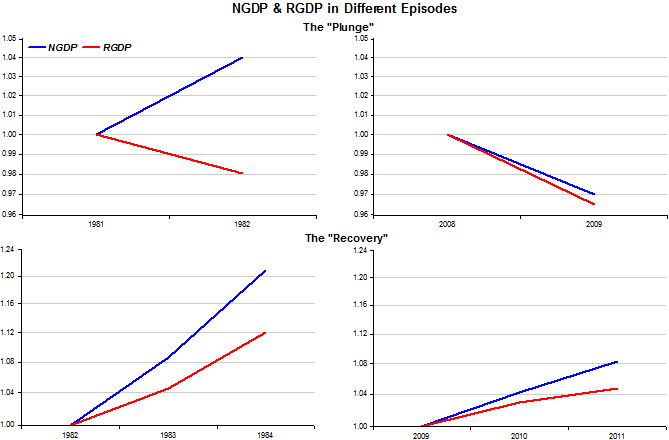 Consider the following three dramatic declines in NGDP growth: 1929-30, 1981-82, and 2008-09. Now think about what the sticky wage model would predict in each case. I’d say a sharp fall in RGDP. And that’s what happened in all three cases. Then what? Here’s where things get interesting. The 1929-30 NGDP decline was followed by an even bigger plunge, so that by early 1933 NGDP was at less than 1/2 of its 1929 peak. 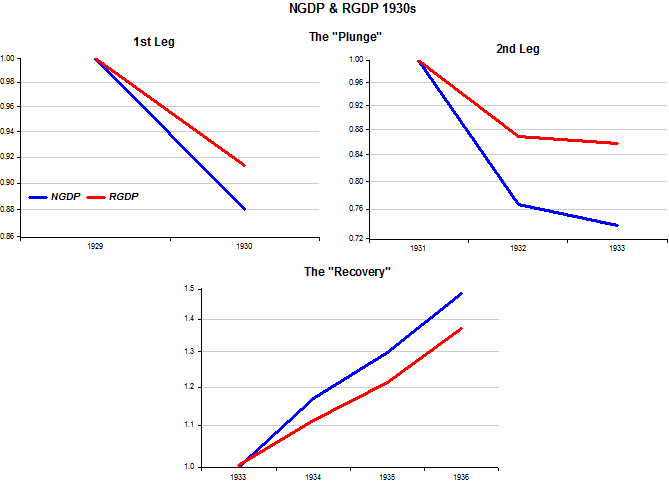 In 1983 and 1984 NGDP soared, rising at an 11% rate in the first 6 quarters of recovery. 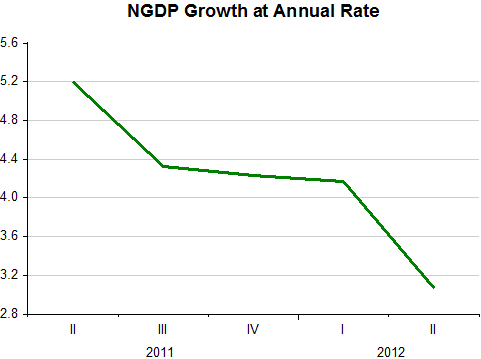 After mid-2009, NGDP grew below trend, roughly 4.2%/year. Now let’s think about what kind of recovery you’d expect in each case if the sticky wage model was true. I’d expect a further fall in RGDP after 1930. I’d expect very rapid growth in RGDP in 1983-84, and I’d expect modest growth in RGDP in the period after mid-2009. As the charts bring out, that´s exactly what happened. Note1: In 1981-82 the Fed´s goal was to bring inflation down from lofty levels. To do that it didn´t “crash” nominal spending; only significantly reduced its growth rate. That was enough, given the inflation expectations at the time, to “crunch” RGDP. Nevertheless, despite the strong rise in nominal spending, inflation expectations shifted down over time. At present, accompanying the feeble rise in nominal spending inflation expectations are also down, and well below “target”. Note2: The scale in the 1930s is in a league of its own! Bottom line: Despite all his studies of the “Great Depression”, Bernanke only managed to contain the “scale” of the event (including on the “uptake”)! The Wall Street Journal asks the wrong question and Menzie Chinn & Jeffry Frieden suggest the wrong solution! The WSJ asks if inflation could revive the economy. Chinn & Frieden answer in the affirmative, ‘selling’ it as: “something completely different – an approach to restoring vigorous economic growth that challenges the received wisdom of our era”. The illustrative chart follows and indicates that the current rate of joblessness is equivalent to inflation running at 4.2%. The big factor holding back economic growth in both the U.S. and Europe, the two economists say, is debt: Consumers, companies and governments are all struggling under the burden of huge debts run up during the boom years, making it harder for them to spend, borrow and invest. Washington, Brussels and London have offered a fairly conventional – and often contradictory – mix of macro-stimulus to increase demand, austerity measures to reassure creditors and debt restructuring when all else fails. But they are loath to use a tried-and-true tool to manage crippling systemic debt: inflation. That’s no misprint: inflation. Lately, the “need for deleveraging” has been elected the major culprit in keeping economic recovery under wraps. Higher inflation is seen as a way to “grease the wheels” of adjustment, to many the only, and much better, alternative to “austerity”. We, the Federal Reserve, have spent 30 years building up credibility for low and stable inflation, which has proved extremely valuable in that we’ve been able to take strong accommodative actions in the last four or five years to support the economy without leading to an unanchoring of inflation expectations or a destabilization of inflation. To risk that asset for what I think would be quite tentative and perhaps doubtful gains on the real side would be, I think, an unwise thing to do. If the Fed raised its inflation target from 2% to 4%, businesses and households might reasonably wonder whether they could raise it again in the future. Such a loss of confidence in the Fed’s discipline could make it harder for the Fed to control inflation in the future. Earlier this year the Fed made the 2% inflation target official. Since that has been Bernanke´s “dream” for at least 15 years, I wonder why so many analysts insist in proposing temporarily higher inflation targets. That´s just not going to happen! If only Bernanke recognized that his obsession with inflation was a major factor behind the steep fall in nominal spending after mid-08, he might concede the point. But he doesn´t, even when it comes out pretty clearly in the FOMC Statements of June, August and September 2008. June/08 – Readings on core inflation have improved modestly in recent months. However, a sustained moderation in inflation pressures has yet to be convincingly demonstrated. Moreover, the high level of resource utilization has the potential to sustain those pressures. In these circumstances, the Committee’s predominant policy concern remains the risk that inflation will fail to moderate as expected. Future policy adjustments will depend on the evolution of the outlook for both inflation and economic growth, as implied by incoming information. August/08 – Although the downside risks to growth have increased somewhat, the Committee’s predominant policy concern remains the risk that inflation will fail to moderate as expected. Future policy adjustments will depend on the outlook for both inflation and economic growth, as implied by incoming information. September 18/08 – Readings on core inflation have improved modestly this year. However, the Committee judges that some inflation risks remain, and it will continue to monitor inflation developments carefully. All over the world, not only in the US, the “inflation targeting obsession” has been the main contributor to an ‘absence of economic recovery’ – notable exceptions being Australia, Sweden and Poland. Interestingly those three countries are faring much better than the others. There is a point here. Why elect politicians to govern the country when the key levers of economic control lie elsewhere? It was the same question asked on Greek squares last month. Liberal Democrats keen to oust Lords from Britain’s Parliament must ponder if it’s worth the bother, when a King down the river holds more power than the lot of them. . . .
At present there is a pretence that the Bank of England’s only target is inflation. Everyone knows this is false: the Bank is pursuing a loose monetary policy to help growth. The Bank should be explicit about this. 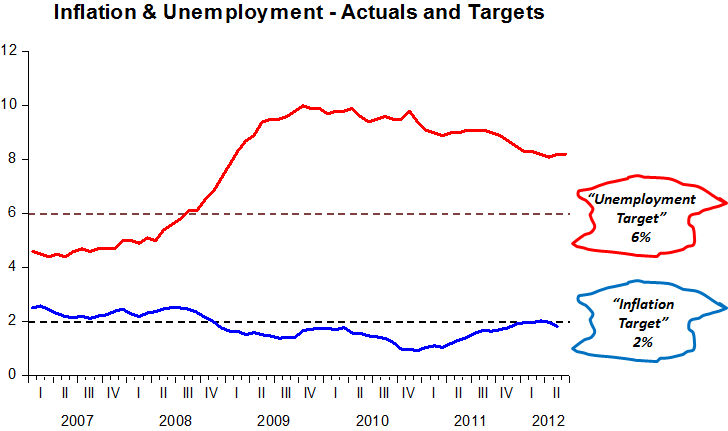 Rather than keep apologising to the Chancellor for overshooting, the Governor should have a mandate to target GDP too. Nominal GDP targeting would be better than the current charade. The credibility of the Bank and the government would be best served by an official change. I like the term ‘charade.’ It’s becoming increasingly clear that inflation targeting was a mistake, and that Bennett McCallum was right all along. NGDP targeting is the logical policy, as it best reflects the actual goal of policymakers around the world. Let’s end this charade. Oh, and if you believe in the debt-deleveraging hypothesis, there’s an additional channel. Higher expected future NGDP makes it easier to handle a given debt load, by reducing future expected debt/income ratios. Or. Mystery solved: Geography determines the Phillips Curve! 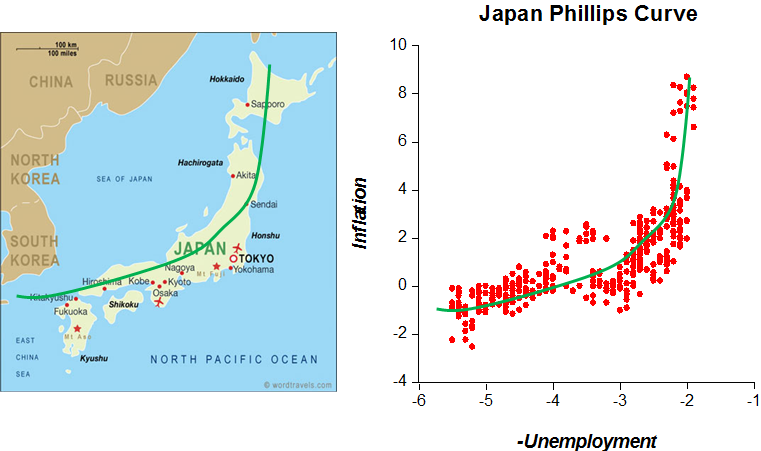 Back in 2005 Gregor Smith found an eerie resemblance between Japan´s Phillips Curve (inflation and minus the unemployment rate). Seven years on, if anything, the resemblance has increased! Update: Given Chile´s very distinct geographical shape, I thought of running the “experiment” with Chilean inflation and unemployment data. 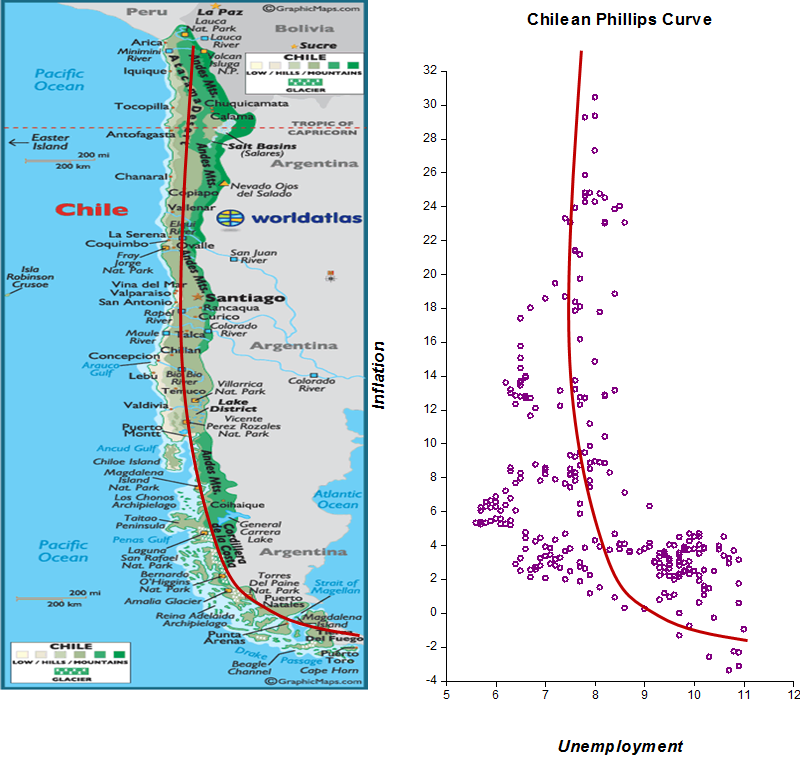 Chile´s Phillips Curve is just as ‘steep’ as the country´s contour, and also wiggles to the right at the bottom! Update 2: Amazingly, it also works out quite well for the US! Trying to lead us to believe that the rise in the debt ratio (mostly reflected in the rise of mortgage debt) is a consequence of wage stagnation since the early 1970s. A chapter of the “debt story” was told in this post. I include additional elements in this chapter. The first point to notice is that the debt ratio only rises significantly after 1983; 10 years after wages stagnate according to his data. Coincidentally, at the time the “Great Moderation” begins! The charts below give a different reading of the whole process. Wages “stagnate” (relative to productivity) only after the “Volcker Transition” has brought inflation down. Notice that the cost of buying a house (getting a mortgage) drops with interest rates tumbling down. 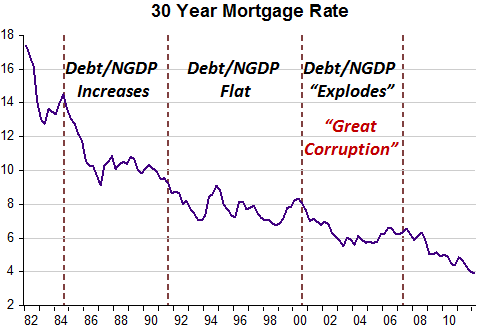 In the 1990s, despite additional interest rate decreases, the mortgage debt ratio stays flat, shooting up during the “Great Corruption” beginning in the early 00s. 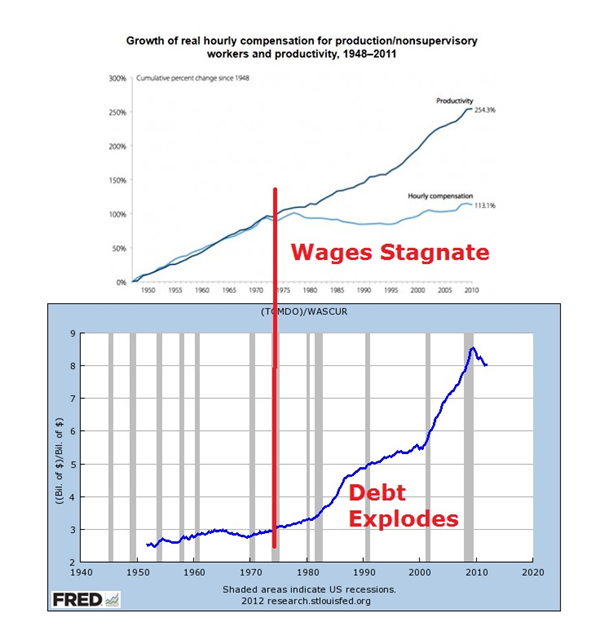 So I´m not convinced of the “wage stagnation story” as harbinger for the rise in debt. Update: Ryan Sanchez sent me this post on the “Debt question”. It´s very much worth reading. Scott, you should think about creating a visual aid that can illustrate how far away we are from achieving the dual mandate. I would think a distribution type diagram, with all the time spent under the targets (inflation and employment/population or number unemployed over NAIRU or whatever) displayed as a big fat tail. Or, if you want to make it more striking, something that includes the cumulative losses in output. The NGDP off its level trend doesn’t resonate with people. It’s abstract for them; even if the concept is relatively simple. 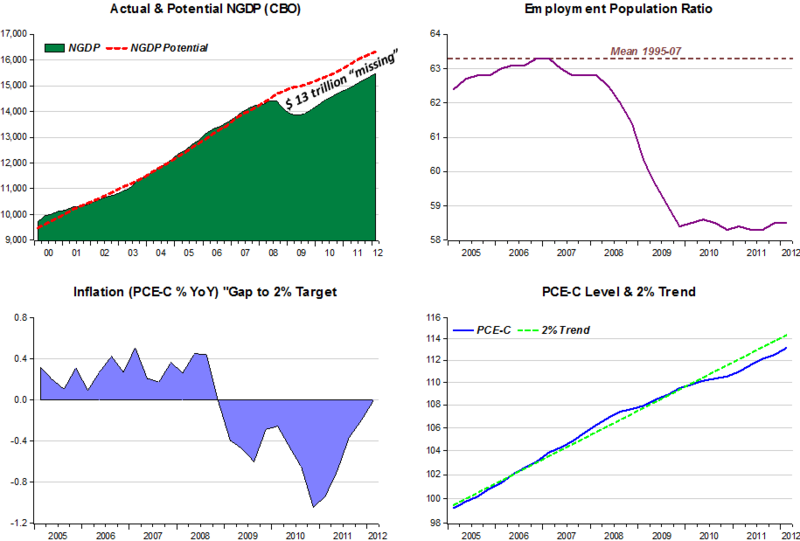 A visual aid of how far the Fed really is off track would be good. Below a panel with a first pass attempt at illustrating the “distance to the dual mandate”. What do you see? 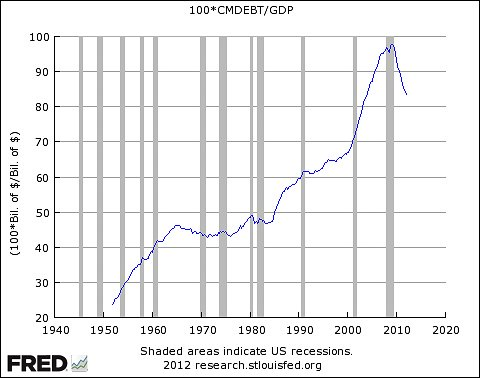 I suppose it’s in the eye of the beholder, but I see three big debt surges: 1952-64, 1984-91, and 2000-08. The first debt surge was followed by a golden age in American history; the boom of 1965-73. The second debt surge was followed by another golden age, the boom of 1991-2007. And the third was followed by a severe recession. What was different with the third case? The Fed adopted a tight money policy that caused NGDP growth to crash, which in turn sharply raised the W/NGDP ratio. Krugman has another recent post that shows further evidence of the importance of sticky wages. Forget about debt and focus on NGDP. It’s NGDP instability that creates problems, not debt surges. Why does the share of debt rise? I believe it reflects peoples “optimism” about future prospects. In the chart below I break down Krugman´s chart and separate mortgage and non-mortgage household debt as a share of NGDP. I also add the behavior of the stock market (here represented by the Dow-Jones Index). 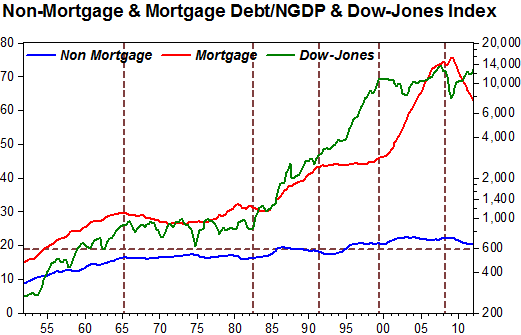 Non-mortgage debt remains relatively stable after 1965, fluctuating in the range of 17% to 22% of NGDP. No problem there. During the 1950s and first half of the 1960s we observe a rise in household debt. People felt good about the future. The stock market gave out the same information. Note, however, that as soon as inflation begins to trend up in the second half of the 60s, the future doesn´t look so bright anymore. Households’ don´t increase indebtedness and the stock market stops rising (falls in real terms). Following the “Volcker Transition”, with inflation being brought down permanently and the economy entering the “Great Moderation”, future prospects ‘brighten’ up again. 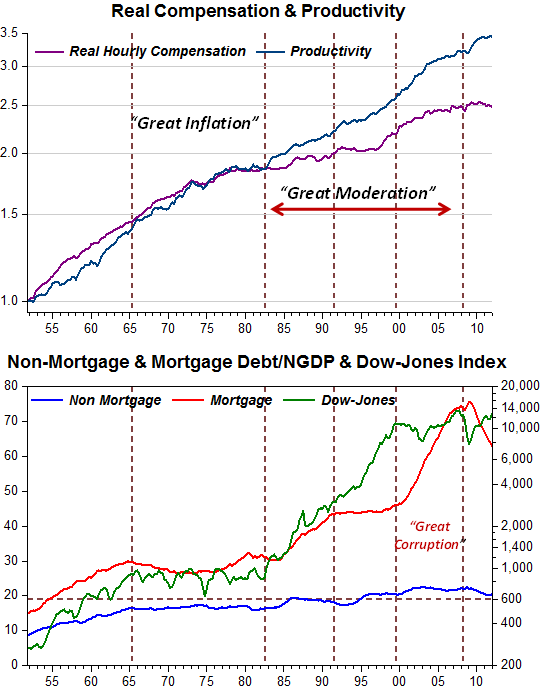 Both mortgage debt and the stock market trend up. This goes on until the early 90s. At that point, likely reflecting the S&L debacle, mortgage debt stops rising despite future prospects remaining bright as indicated by the stock market´s upward trend. In the 00s the story is reversed. The stock market ‘brakes’ while mortgage debt picks up strongly. To me that´s an indication of some inconsistency. The institutions that permitted the ‘homeownership’ program were in place (CRA, tax breaks) and Fannie & Freddie were there to provide “guarantees”. A bit of required macroeconomic adjustment also came in ‘handy’. Following the Asia crisis in the late 90s, the US became the ‘buyer of last resort’ to the world. The US current account deficit increased. For that to take place, while ‘Asia’ had to relocate resources from the nontradable (say housing) sector to the tradable sector, the US had to travel the opposite route. In other words, houses had to move from Asia to the US! And it was done in spades! Wrong incentives, bad policy, and corruption. That´s all true and there was no escaping ‘judgment day’. What didn´t need to happen was monetary policy trying to ‘suffocate’ the economy while it was in the process of adjustment. Just think what would have happened if the post WWII adjustment (that required a steep reduction in government spending, the generation of civilian employment for millions, etc.) had to take place with the Fed at the same time pursuing a contractionary monetary policy, i.e. restraining spending (NGDP) growth. The US would be another country altogether today.